The basic premise of the group exhibition HOW CHINESE is to explore and expand the discourse concerning Chinese contemporary art with the title operating as a question as well as a statement. What I'm interested in accomplishing is to expand the definition beyond the narrow genre where works are identifiably and conventionally "Chinese Contemporary." The artists included will represent a spectrum of the Chinese diaspora and will also include 1 or 2 artists who are not Chinese, but whose works deal with Chinese subject matter. I will also be organizing a panel discussion for the exhibition during Asian Contemporary Art Week (May 10-18) which will include eteh artists curators and a well know Asian contemporary art critic. The intention of HOW CHINESE is to make people rethink and realize that "Chinese Contemporary" is an ongoing dialogue, like any stream of history that is evolving, mutating into something ever more complex, rich and diverse and therefore not so easily defined. 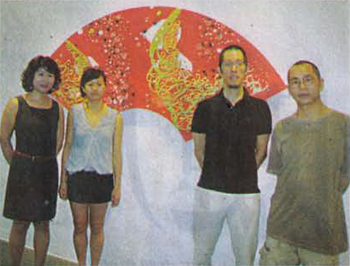 The interesting range of artists from non-Chinese to mainland-born, ABC, from Taiwan, and Tibetan will all exhibit work that has an abstract leaning. I want to avoid showing works that easily identify whether the artist is Chinese or not. This is one of the things I want to challenge that is so prevalent with a lot of better known Chinese Contemporary works.